Q: Where can I find product manuals and specifications for the StageSource speakers? 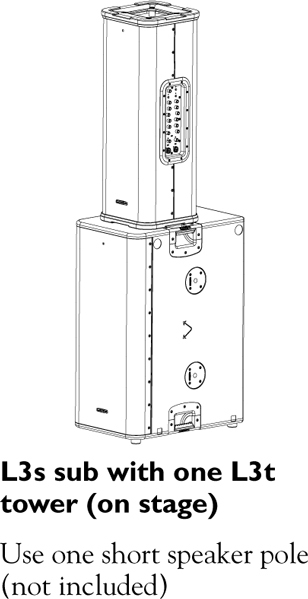 A: Product manuals and specifications for the StageSource L3t can be found Here. Product manuals and specifications for the StageSource L3s can be found Here. Q: How do I use the StageSource L3t or L3m? A: Check out our video tutorial "
". We also have examples of some common ways to setup the StageSource speakers available Here. Q: Why can't I hear anything from the middle driver on my L3t or L3m? A: The upper woofer always plays below 250Hz. The lower woofer works with the HF driver with a crossover that varies between 2.2 kHz and 7 kHz, depending on the chosen speaker mode. The details for these specs are listed here. Q: What are Smart Speaker Modes? Reference/P.A. - Reference/P.A. mode is for live sound reinforcement and features a flat frequency response, a 2.2kHz crossover frequency and maximum low-frequency extension. This mode is the optimal reference setting, whether your cabinet is mounted on a tripod, on stage or installed as part of a larger multi-component system. Playback - Playback mode is optimized for pre-recorded music. Functionally, Playback mode is similar to P.A. mode but includes an EQ curve that emphasizes extreme low and high frequencies, making it well-suited for playing back music from a CD or MP3 player, or for DJ applications. 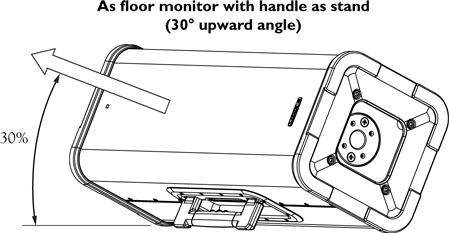 Floor Monitor - Floor Monitor mode is similar to P.A. mode with a slight reduction in low frequency content to counteract coupling when placing the speaker on the floor. If the speaker is powered on while in a horizontal position, Floor Monitor speaker mode will be selected automatically, you can then change to a different mode, if desired. Keyboards - Keyboard Mode optimizes the L3t for use as backline amplification for a keyboard rig. This mode features a flat frequency response with a 3.5kHz crossover frequency, adding more relative energy to the cone and providing a warmer response that is pleasant for instruments. This mode also provides Virtual Tilt-back, which optimizes the speakerâ€™s tuning to achieve an upward tilt to its main axis and aim the sound towards the performer. Acoustic Guitar - Acoustic Guitar mode is optimized to provide a warm and balanced full-range amplification experience for acoustic instruments. This mode also features a 3.5kHz crossover frequency, with a custom-tailored low-frequency response to minimize â€œboominessâ€ than can occur when amplifying acoustic instruments. Acoustic Guitar mode provides Virtual Tilt-Back, which optimizes the speakerâ€™s tuning to achieve an upward tilt to its main axis and aim the sound towards the performer. Electric Guitar - Electric Guitar Mode was designed to accommodate the modern guitarist who uses a multi-effects floorboard device such as the Line 6 PODÂ®. Rather than sending the signal from the guitaristâ€™s floorboard to an amplifier and then micâ€™ing the amp, this L3t mode features an overall frequency response that emulates the sound of a 212 combo amp. The dual 10â€ speakers play full range, with the horn adding only the smallest amount of sparkle to the sound. Q: Will StageSource L3t and L3m function as a floor monitor? A: The StageSource L3t and L3m feature two sets of kickstands that can be used to angle the speakers upwards towards the performer. The two back-panel kickstands flip out, allowing the L3t and L3m to be angled upwards at 60Â°, the side mounted carrying handle doubles as a kickstand as well, allowing the L3t and L3m to be angled upwards at 30Â°. The StageSource L3t and L3m both include a smart speaker mode optimized for using the loudspeaker as a floor monitor. If the speaker is powered on while in a horizontal position, Floor Monitor speaker mode will be selected automatically. Check out our video tutorial on "
" to see how to how to use the built in kickstands. 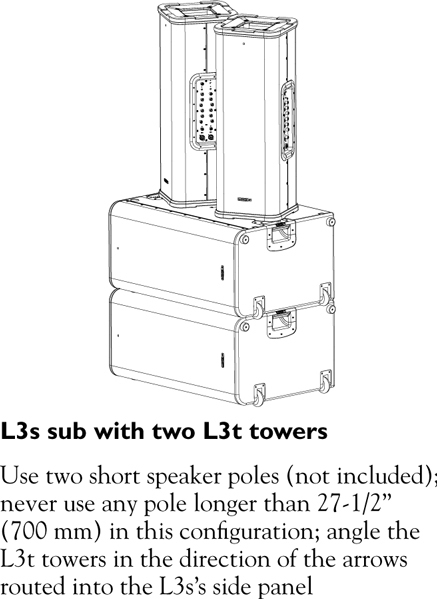 Q: How does the L6 Link Network work with the StageSource speakers? ". When connecting speakers together in a L6 Link network, we recommend using 110-ohm AES/EBU XLR cables. Q: Can the StageSource speakers be pole mounted? Q: What is the proper method for suspending the StageSource speakers? A: The StageSource L3t and L3m provide four threaded M10 attachment points for suspension and one threaded M10 attachment point for pull-back and aiming the speaker. These are designed to allow for suspending the loudspeaker only by a qualified professional familiar with safe rigging practices. Improper installation may result in damage to the speaker or support structure, or injury or death. WARNING! If you are unfamiliar with suspending loudspeakers, conÂ­sult an authorized, qualified professional prior to installation. WARNING! Before rigging or suspending any loudspeaker product, inÂ­spect all rigging hardware, cabinets, attachment points, transducers, and associated peripherals. Any absent, warped, or non-load rated equipment could seriously compromise the strength of the installation and should be immediately corrected. WARNING! Always follow all municipal building codes, as well as any local, state, and federal safety guidelines regarding the installation and operation of loudspeakers and associated peripherals. 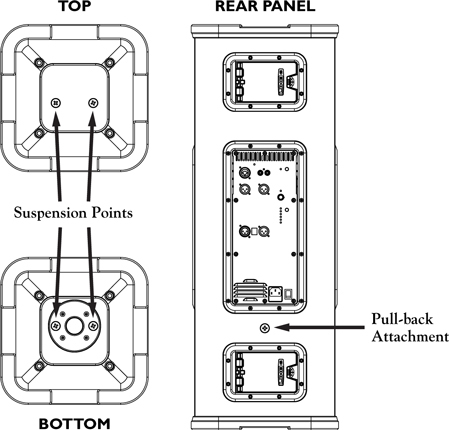 Always use two attachment points on either the top or bottom of the L3t/L3m The rear panel pull-back attachment point is only for aiming the speaker downwards (see illustration below); it is not to be used as a load-bearing suspension point. 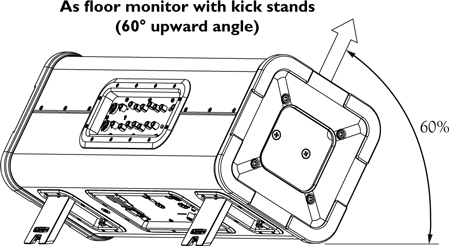 For permanent installations, use only the Line 6 eyebolt kit (Part # 98-037-0005). Q: Can I use a different crossover with the StageSource speakers? 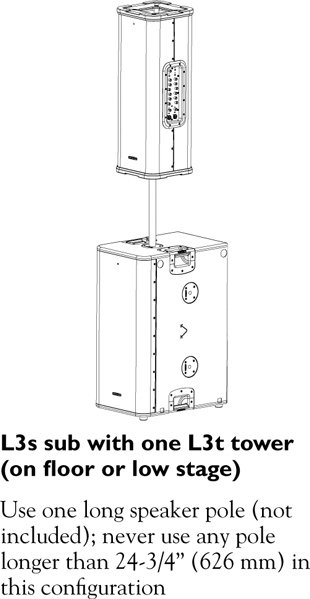 A: Using an external crossover is not recommended when using L3t tops with L3s subs. Simply connecting the pair via Line 6 link activates the precision engineered internal crossover and DSP. However when matching the L3t speaker system with a 3rd party subwoofer an external crossover may be necessary. In this case, connect the Main outputs of your mixer into your crossovers inputs. Connect the high/mid frequency output of the crossover to the rear panel Line Level Input of the L3t or L3m loudspeaker, than connect the low frequency output of the crossover into the line input of a self-powered subwoofer system or into the power amp that powers your passive subwoofer cabinet. Q: Can I install a different speaker driver into the StageSource speaker cabinet? A: The speaker drivers used are specifically designed for the speaker cabinets and speaker modes used with the StageSource series. Changing the speaker drivers can effect reliability and performance and will void the manufacturer warranty. Q: Where do I register my new StageSource speakers? A: Line 6 products can be registered to your Line 6 User account Here. Q: Where can I find out more information about Live Sound? A: Check out our Live Sound Resources and Live Sound Glossary of Terms. Wo kann ich BenutzerhandbÃ¼cher und Spezifikationen der StageSource Lautsprecher finden? HandbÃ¼cher und Spezifikationen des StageSource L3t kÃ¶nnen Sie hier finden, HandbÃ¼cher und Spezifikationen des L3s hier und fÃ¼r das L3m, hier. Wie benutze ich die StageSource L3t und L3m? Reference/P.A. : Der Reference/P.A. Modus dient der verstÃ¤rkung von Live Sound und hat einen fixen Frequenzgang, eine 2.2kHz Trennfrequenz und zusÃ¤tzlich eine Erweiterung der maximal Tieffrequenz. Dieser Modus ist die beste Allgemeineinstellung egal ob Ihr GerÃ¤t nun auf einem Dreibein befestigt ist, auf der BÃ¼hne steht oder in ein grÃ¶ÃŸeres System mit mehreren Komponenten eingebunden ist. Playback: Der Playback Modus ist optimal fÃ¼r voraufgezeichnete Musik. Funktionell ist dieser Modus dem P.A. Modus sehr Ã¤hnlich. Er beinhaltet jedoch eine EQ Kurve, die extrem tiefe und hohe Frequenzen betont, was ihn perfekt zum Abspielen von Musik eines CD/MP3 Players oder zur Benutzung von DJ Anwendungen macht. Floor Monitor: Der Floor Monitor Modus ist auch wieder Ã¤hnlich dem P.A. Modus, jedoch mit einer leichten Minderung des Tieffrequenzberiches, was eine Bass Frequenzkopplung unterdrÃ¼ckt wenn man den Monitor auf den Boden stellt. Wenn der Lautsprecher angeschaltet ist wÃ¤hrend er sich in einer horizonatalen Position befindet wird der Floor Monitor Modus automatisch eingeschaltet. Sie kÃ¶nnen dann immernoch den Modus wieder umstellen wenn Sie mÃ¶chten. Keyboards: Der Keyboard Modus optimiert den L3t zur Nutzung als Backline VerstÃ¤rker fÃ¼r ein Keyboard-Rig. Dieser Modus hat eine fixen Frequenzgang mit einer 3.5kHz Trennfrequenz, was zusÃ¤tzliche Energie an die Membran liefert und so eine wÃ¤rmere Resonanz erzeugt, die besser ist fÃ¼r Instrumente. Acoustic Guitar: Der Acosutic Guitar Modus ist auf warme und balancierte VerstÃ¤rkung fÃ¼r akustische Instrumente optimiert. Dieser Modus hat eine 3.5kHz Trennfrequenz mit maÃŸgeschneiderter Tieffrequenz um DrÃ¶hnen zur vermindern, welches entstehen kann wenn man akustische Instrumente verstÃ¤rkt. AuÃŸerdem optimiert dieser Modus noch die Abstimmung des Lautsprechers um eine AufwÃ¤rtsneigung zu simulieren und so den Ton auf den KÃ¼nstler zu richten. Electric Guitar: Der Modus Electric Guitar wurde fÃ¼r den modernen Gitaristen entworfen, der ein Multi-Effekt Floorboard wie das Line 6 PODÂ® benutzt. Anstatt das das Signal vom Floorboard an den VerstÃ¤rker gesendet wird, simuliert der Lautsprecher den Ton einer 212 Combo anhand eines angepassten Gesamtfrequenzganges. Die doppelten 10" Lautsprecher spielen hier die volle Spektrum. Das Horn fÃ¼gt nur noch die kleinste Verfeinerung hinzu. Funktionieren die StageSource L3t und L3m als Bodenmonitore? StageSource L3t und L3m haben zwei SÃ¤tze von ausklappbaren StÃ¤ndern, die benutzt werden kÃ¶nnen um den Lautsprecher auf den KÃ¼nstler zu richten. Die zwei StÃ¤nder auf der RÃ¼ckseite des L3t und L3m kÃ¶nnen ausgeklappt werden um einen Winkel von 60Â° zu erzeugen und der Tragegriff kann ausgeklappt werden und dient so auch als StÃ¤nder mit einem Winkel von 30Â°. L3t und L3m enthalten beide einen Smart Speaker Modus, der die Lautsprecher als Bodenmonitore optimiert. Wenn der Lautsprecher angeschaltet ist wÃ¤hrend er in horizontaler Position ist, schaltet sich der Floor Monitor Modus automatisch an. FÃ¼r eine Anleitung schauen Sie sich bitte dieses Video an: "
Wie funktioniert das L6 Link Netzwerk mit den StageSourde Lautsprechern? Dieses Video beschreibt die Nutzung von L6 Link: "
". Wenn Sie Lautsprecher in ein L6 Link Netzwerk einbinden wollen empfehlen wir die Nutzung von 110 Î© AES/EBU XLR Kabeln. Kann man die StageSource Lautsprecher auf eine Stange montieren? Die StageSource L3t und L3m haben beide eine standard 35mm Einfassung. Was ist die ordnungsgemÃ¤ÃŸe Methode zur AufhÃ¤ngung meiner StageSource Lautsprecher? Die StageSource L3t und L3m Lautsprecher bieten vier M10 Befestigungspunkte fÃ¼r die AufhÃ¤ngung und einen M10 Befestigungspunkt um den Lautsprecher nach hinten zu ziehen und auszurichten. Diese sind dazu entworfen, von einem qualifizierten Professionellen mit ausreichend Rigging-Erfahrung, den Lautsprecher aufzuhÃ¤ngen. Nicht ordnungsgemÃ¤ÃŸe Befestigung oder AufhÃ¤ngung kann denn Lautsprecher, die AufhÃ¤ngung beschÃ¤digen und zu Verletzungen und Tod fÃ¼hren. ACHTUNG! Wenn Sie sich nicht mit der AufhÃ¤ngung von Lautsprechern auskennen konsultieren Sie bitte einen autorisierten, qualifizierten Professionellen vor der Installation. ACHTUNG! Vor dem Riggen oder AufhÃ¤ngen eines Lautsprechers mÃ¼ssen Sie immer jegliche Hardware, Boxen, Befestigungspunkte, Wandler, und alle anderen angeschlossenen GerÃ¤te Ã¼berprÃ¼fen. Jedes fehlende, verbogene Material oder Material, welches keine Belastbarkeitsmarkierung hat, kÃ¶nnte die Festigkeit des Aufbaus kompromittieren und sollte umgehend korrigiert werden. ACHTUNG! Folgen Sie immer den kommunalen Bauvorschriften sowie lokalen, staatlichen und fÃ¶deralen Sicherheitsrichtlinien in Bezug auf den Aufbau und Betrieb von Lautsprechern und dazugehÃ¶rigen PeripheriegerÃ¤ten. Benutzen Sie immer zwei Befestigungspunkte entweder oben oder unten des L3t/L3m. Der hintere Befestigungspunkt ist ausschlieÃŸlich zur Ausrichtung des Lautsprechers abwÃ¤rts (wie auf folgendem Bild) und darf nicht als tragender AufhÃ¤ngungspunkt benutzt werden. Kann ich ein anderes Crossover mit meinen StageSource Lautsprechern benutzen? Die Nutzung eines externen Crossovers mit L3t Tops und L3s Subs ist nicht empfohlen. Die Verbindung der Beiden via Line 6 Link aktiviert das interne Crossover und die digitale Signalverarbeitung. Wenn Sie jedoch den L3t Lautsprecher mit einem Subwoofer eines Drittanbieters verbinden kÃ¶nnte ein exteres Crossover von NÃ¶ten sein. In diesem Fall mÃ¼ssen Sie dann die Main Outs des Mixers in die Crossover EingÃ¤nge stecken. Verbinden Sie den Hoch-/Mittenfrequenz Ausgang des Crossovers mit dem Line Level Eingang des L3t oder L3m Lautsprechers und verbinden Sie dann den Ausgang der Tieffrequenz des Crossovers mit dem Line Eingang des Subwoofers (sofern mit externer Stromversorgung ausgerÃ¼stet) oder in die Endstufe, die Ihren passiven Subwoofer versorgt. Kann ich einen anderen Treiber auf die StageSource Lautsprecher installieren? Die Lautsprechertreiber, die auf den StageSource installiert sind benutzen speziell fÃ¼r die Modelle entworfene Treiber und Lautsprecher Modi. Das Wechseln der Treiber kann Performance und VerlÃ¤sslichkeit beeintrÃ¤chtigen auÃŸerdem hebt es die Herstellergarantie auf. Wo kann ich meine neuen StageSource Lautsprecher registrieren? Line 6 Produkte kÃ¶nnen auf Ihrem Line 6 Benutzerkonto registriert werden: Hier. Wo kann ich mehr Informationen Ã¼ber Live Sound finden? OÃ¹ est-ce que je peux trouver des manuels et spÃ©cifications des haut-parleurs StageSource? Manuels d'utilisations et spÃ©cifications du StageSource L3t ici, les manuels et spÃ©cifications du L3s ici et pout le L3m, vous les pouvez trouver ici. Comment est-ce que j'utilise le StageSource L3t ou L3m? Consultez notre vidÃ©o tutoriel "
" (anglais). Quelques exemples communs pour installer les haut-parleurs StageSource: Ici. Que sont les modes Smart Speaker? Reference/P.A. : Reference/P.A. est pour renforcement du son live et a une rÃ©ponse en frÃ©quence fixÃ©e, une frÃ©quence de coupure de 2.2kHz et une extension de basse-frÃ©quence maximale. Ce mode est le rÃ©glage optimal si votre haut-parleur est montÃ© sur un trÃ©pied, sur scÃ¨ne ou installÃ© comme partie d'un systÃ¨me plus grande Ã plusieurs composants. Playback: Le mode Playback est optimisÃ© pour la musique prÃ©enregistrÃ©e. Ce mode est similaire au mode P.A. mais a une courbe d'Ã©galisation qui met l'accent dur les frÃ©quences extrÃªmement basses et hautes que le fait le mode optimal pour jouer la musique d'un lecteur MP3 ou CD ou pour les applications DJ. Floor Monitor: Le Mode Floor Monitor est similaire au mode P.A. mais avec une rÃ©duction en contenu en frÃ©quence basse pour neutraliser le couplage si vous le placez sur le sol. Si l'haut-parleur est allumÃ© et en position horizontale, le mode Floor Monitor est sÃ©lectÃ© automatiquement mais vous pouvez le changer si dÃ©sirÃ©. Keyboards: Le mode Keyboard optimise l'haut-parleur pout l'utilisation avec un rig au clavier. Ce mode a une rÃ©ponse en frÃ©quence fixÃ©e avec une frÃ©quence de coupure de 3.5kHz, ce qu'ajoute d'Ã©nergie relative Ã la cÃ´ne et offre une rÃ©ponse amÃ©liorÃ©e pour l'utilisation avec des instruments. Ce mode change aussi le rÃ©glage du haut-parleur pour atteindre une inclination vers le haut et vise comme-Ã§a le son vers l'artiste. Acoustic Guitar: Le mode Acoustic Guitar est optimisÃ© pour l'expÃ©rience d'amplification en pleine-gamme Ã©quilibrÃ©e avec les instruments acoustiques. Ce mode a une frÃ©quence de coupure de 3.5kHz avec une rÃ©ponse en frÃ©quence basse sur mesure pour rÃ©duire la rÃ©sonance que peut se produire si on amplifie des instruments acoustiques. Le mode Acoustic Guitar change aussi le rÃ©glage du haut-parleur pour atteindre une inclination vers le haut et vise comme-Ã§a le son vers l'artiste. Electric Guitar: Le mode Electric Guitar a Ã©tÃ© crÃ©Ã© pour le guitariste moderne, qui utilise un floorboard come le Line 6 PODÂ®. PlutÃ´t que le signal sera transfÃ©rÃ© du floorboard au amplificateur, ce mode a une rÃ©ponse de frÃ©quence globale qui Ã©mule le son d'un ampli combo 212. Les deux haut-parleurs 10" jouent en gamme complÃ¨te. Le Pavillon Ã chambre de compression ajoute seulement une peut de vivacitÃ©. Est-ce que StageSource L3t et L3m fonctionnent comme retour de scÃ¨ne? StageSource L3t et L3m ont deux sÃ©ries de kickstands lesquelles peuvent Ãªtre utilisÃ©s pour orienter le haut-parleur vers l'artiste. Les deux kickstands du panneau arriÃ¨re dÃ©plient pour un angle de 60Â° mais la poignÃ©e de transport est aussi un kickstand qui dÃ©plie pour un angle de 30Â°. L3t et L3m comprennent un mode Smart Speaker optimisÃ© pour l'utilisation comme retour de scÃ¨ne. Si le haut-parleur est allumÃ© en position horizontale, le mode Floor Monitor sera sÃ©lectÃ© automatiquement. Ce vidÃ©o vous aide avec l'utilisation des kickstands: "
Comment est-ce que L6 Link fonctionne avec les haut-parleurs StageSource? Regardez ce vidÃ©o tutoriel: "
" (anglais). Si vous connectez vos haut-parleurs avec un rÃ©seau L6 Link, nous recommandons un cÃ¢ble AES/EBU XLR de 110 Î©. Est-ce que je peux monter StageSource sur un poteau? Quelle est la propre mÃ©thode de suspendre les haut-parleurs StageSource? Les StageSource L3t et L3m ont quatre points de fixation M10 pour la suspension et un point de fixation M10 pour tirer et viser l'haut-parleur. Ces points sont crÃ©Ã©s pour la suspension du haut-parleur seulement par un professionnel qualifiÃ© avec pratique sÃ»re. Installation incorrecte peut causer de dommage au haut-parleur, la structure ou blessure ou dÃ©cÃ¨s. ATTENTION! Si vous ne savez pas comment suspendre des haut-parleurs, consultez du personnel qualifiÃ© avant l'installation. ATTENTION! Avant que vous suspendiez un produit haut-parleur, vÃ©rifiez toujours tous le matÃ©riel, haut-parleurs, points de fixation, transducteurs et pÃ©riphÃ©riques associÃ©s. N'importe quel produit manquant, dÃ©formÃ© ou sans capacitÃ© de gain spÃ©cifiÃ©e peut compromettre la robustesse de l'installation et doit Ãªtre corrigÃ© directement. ATTENTION! Suivez toujours les codes du bÃ¢timent municipaux et les directives de sÃ©curitÃ© locale, gouvernementale et fÃ©dÃ©rale concernant l'installation et exploitation des haut-parleurs et pÃ©riphÃ©riques associÃ©s. Utilisez toujours deux points de fixation en dessus ou dessous du L3t/L3m. Le point de fixation en arriÃ¨re est uniquement pour viser le haut-parleur et ne peut pas Ãªtre utilisÃ© comme point de fixation portant. Utilisez uniquement les Line 6 Eyebolt Kits (Part # 98-037-0005) pour les installations permanentes. Est-ce que je peux utiliser un crossover diffÃ©rent avec les haut-parleurs StageSource? Ce n'est pas recommandÃ© d'utiliser un crossover externe avec les L3t tops et L3s subs. Simplement connecter les deux via L6 Link active le crossover et DSP interne. Si vous soulez connecter le L3t avec un subwoofer d'un tiers, un crossover externe peut-Ãªtre nÃ©cessaire. Dans ce cas, connectez les Main Outs du mixeur avec les entrÃ©es crossover. Connectez les sorties de frÃ©quence mi/haute du crossover au panneau en arriÃ¨re (Line Level) du L3t ou L3m et connectez la sortie de frÃ©quence basse du crossover au Line In du systÃ¨me subwoofer (avec alimentation externe) ou au ampli de puissance qui fais fonctionner le subwoofer passive. Est-ce que je peux installer d'autres pilotes dans mon haut-parleur StageSource? Les pilotes sont spÃ©cialement conÃ§u pour les haut-parleurs StageSource et les modes apprenantes. Le changement du pilote peut affecter la fiabilitÃ© et performance et annulera la garantie. OÃ¹ est-ce que je peux enregistrer mes StageSource? Les produits Line 6 peuvent Ãªtre enregistrÃ©s sur votre compte Line 6 ici. OÃ¹ est-ce que je peux trouver plus d'informations sur Live Sound? Essayez ses liens (en anglais): Live Sound Resources et Live Sound Glossary of Terms.